Baby rhino loves getting scratched at the Care for Wild Africa Rhino Sanctuary. Care for Wild is the largest rhino orphanage in the world and is determined to rescue, care, and rehabilitate wildlife that has been injured and/or orphaned. Since 2013, over 3750 rhinos have been poached in South Africa alone! The ongoing crisis has left many baby rhinos badly injured and orphaned, and the staff and volunteers at Care for Wild Africa are determined to give these animals a future. Care for Wild Africa has provided many volunteers from abroad with the opportunity to work with African wildlife, an opportunity that they have absolutely treasured. This opportunity has provided the spark for a number of people looking for “something” to do with their lives to move towards animal care and rehabilitation. Care for Wild Africa has a wide selection of animals passing through its doors including lion, giraffe and rhino. This video from the Working With Rhinos shows us how to perform the finest of rhino relaxation techniques. It looks like the sweet spot is right behind the ears. 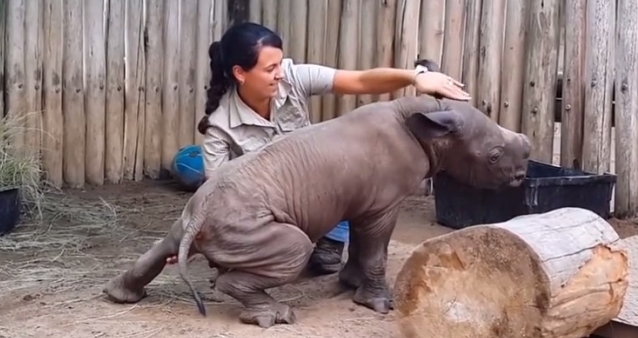 Responses to "Kind Caretaker Treats Baby Rhino to a Massage and He Reacts in the Sweetest Way Possible"